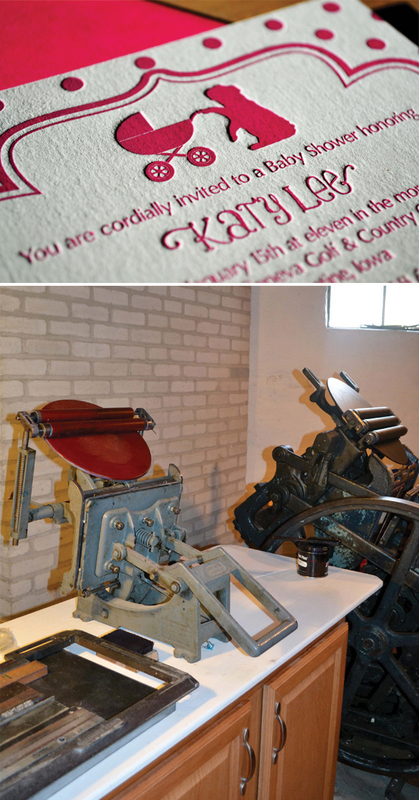 From a bizarre love affair with metal plates while crafting tailored social stationery to the dream of running a small business, Shauna Rue of Purple Ink Press exemplifies the drive and playfulness of letterpress printing. We sat down with Shauna to catch a glimpse of how all of the pieces came together to capture the happy-go-lucky heart of letterpress. BEAUTY IN THE BAY STATE My name is Shauna Rue and I am the owner of Purple Ink Press, which I created in 2010. 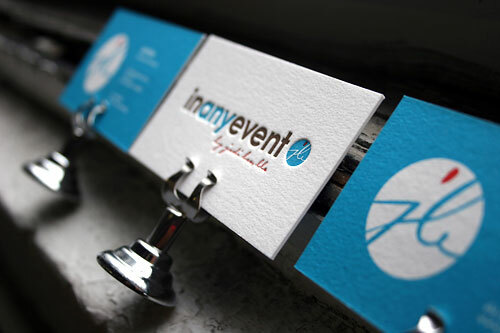 I design and print customized letterpress invitations, baby announcements, business cards, and all types of social stationery. I live and work in the Worcester area of Massachusetts. I have been married to my husband, Mark, for 7 years, and we have two beautiful children together: Wyatt, 2, and Emerson, 8 months. FOR THE LOVE OF LETTERPRESS Like many new printers, I first discovered letterpress when I was looking for my own wedding invitations back in 2005. Two years later, I was still OBSESSED with letterpress, and I found John Barrett with Letterpress Things out in western Massachusetts. I took a few classes and I was hooked―John wouldn’t sell me a floor press until I put my time in on a tabletop, so I came home with my Kelsey 6 x 10, a cabinet, and drawers of type. I printed incessantly on nights and weekends and during vacation time from my corporate job, practicing the craft and familiarizing myself with different papers and plates. In 2009, the timing was right so I left my full-time job and found a Chandler & Price 10 x 15 floor press in need of a good home. I have been printing happily since then. PARADISE IN THE PRINT SHOP My print shop is in the basement of my home, which luckily has great light and space. 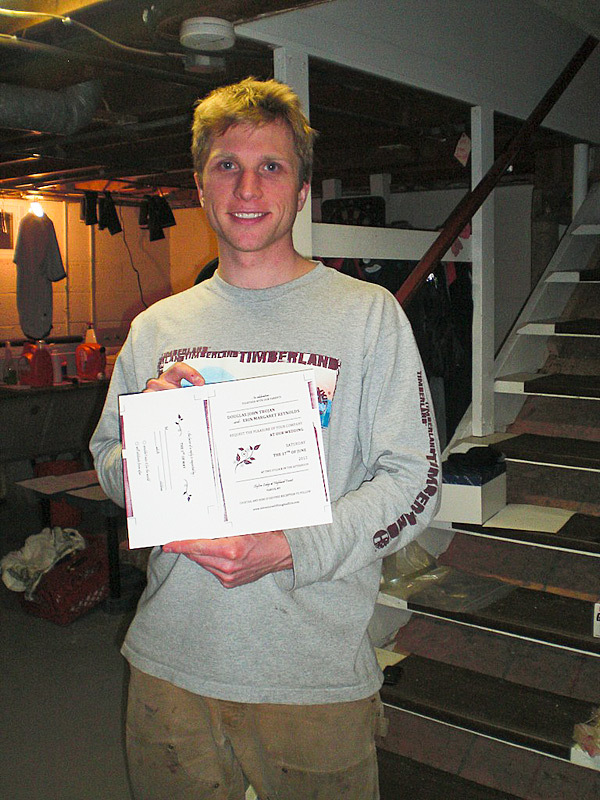 I actually love having the presses at the house, since I am a night owl and like to print at all hours. With that being the case, I still love using rubber based inks that I can keep open on the press. There is always a dog at my feet and I have drawers and drawers of type that I need to organize. I tell myself it’s all part of the creative process! THE CREATIVE PROCESS The majority of my work is custom wedding invitations and accompaniments, so I like to talk to the couple about their wedding―when we can’t meet in person, we’ll talk on the phone or through email. I like to gather the details before I draft an idea for the invitations. To me, seeing a picture of the dress is often the most useful visual for creating an invitation suite that best reflects the event. From there, I put my ideas on paper―I still use a sketchbook and pencil to flush out my ideas before putting them on the computer. I always keep in mind to design to the letterpress’ strengths―i.e., I’ve only made the mistake of printing light ink on dark paper once! FULL TIME FUN I design and print [and] yes, I’ve been printing full time since 2010. I can’t believe Purple Ink will be celebrating its third birthday in February! This year, however, I took an extended maternity leave, so I only printed a handful of select projects. Back in April, I finished printing a job and went into labor 5 hours later, so I knew I needed to slow down a bit after the birth of my daughter. PRINTING FEATS My biggest accomplishment was deciding to start and run a letterpress business full-time – that was very scary for me, but I am so happy that I took the plunge! Everything else is an extension of that decision and I feel lucky every single day I am working. Running a small business has been a dream come true, and I have the luxury of making every job unique and customized to each customer. To me, it is a huge accomplishment to see genuinely ecstatic reactions to my work or hear from a couple that I captured the true essence of their style, love story, and wedding through my art. I love being able to be creative and constantly work at my craft and try to improve. And being interviewed for a blog such as this one or speaking at a local college as a guest art professor definitely makes me proud! BOXCAR’S ROLE The deep relief base and photopolymer plates, baby! At the beginning of December, I just started the process of transferring my entire shop over to polymer: I love that the plates can be recycled at the end of each job and the fact that the platemaking process is less taxing on the environment. 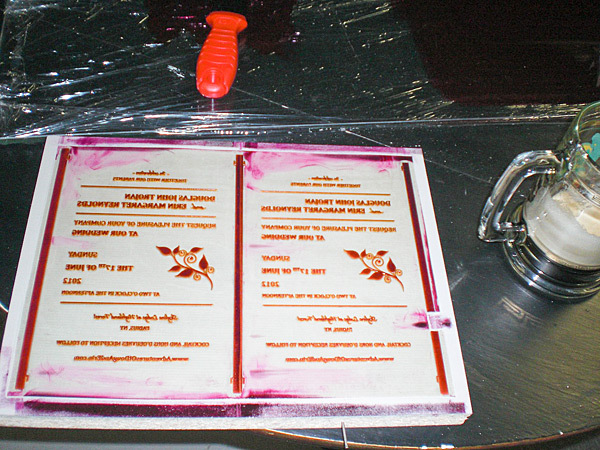 I had dabbled with photopolymer in the past, but I held onto a bizarre love affair with metal plates. Happy to have finally seen the light! My favorite shop tool―hands down―is the Boxcar roller gauge. SHOP TIPS When I first started my stationery line, I tried to come up with cards that I thought people would like and it was a disaster. I quickly learned that if I print what I like, someone out there will find it. 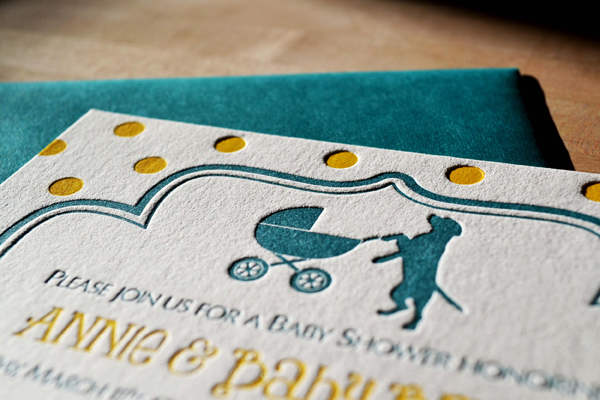 One of my most popular baby shower prints is the dog pushing the baby carriage, which I originally designed for my own shower invitations because I wanted to incorporate my current ‘kids’―my yellow lab and my French bulldog―into the celebration. Sure enough, I’m not the only crazy dog lover out there, and I have since printed bulldogs, dachshunds, cocker spaniels, and countless Labradors pushing baby carriages. WHAT’S NEXT I am very excited for 2013. I re-launched my website in January, which is perfect timing after my extended maternity leave. Recently, I have been designing invitation suites using a combination of paper textures, finishes, thickness, colors, fonts, and materials. I’m also doing more with ready-to-order letterpress cards and add-ons to invitation suites, such as letterpress coasters, table signs, and place cards for weddings. I can’t wait to show them off! I have definitely evolved over the years and in 2013 I really want to encourage my customers (and brides everywhere!) to be unique, creative, and fun. I love how all of the pieces of a suite eventually come together beautifully and can truly capture the personality and heart of a wedding or event. A goal for my bridal customers is to create wedding invitations that will make guests excited about their wedding! Some other plans for 2013 include continuing to work with some charities that I partnered with in 2012. Giving back to my community and organizations that are close to my heart is an important aspect of my life and my business. In an effort to extend this sentiment to my customers, I am going to offer couples the opportunity to donate to registered charities in exchange for letterpress cards, coasters, and other specialty items. I’m trying to make 2013 the year of giving back! Huge round of thanks out to Shauna for letting us catch a colorful glimpse of Purple Ink Press! Letterpress love is in the air! Or at least that’s the case of this soon-to-be-hitched Central New York couple, Douglas Trojan and Erin Reynolds. 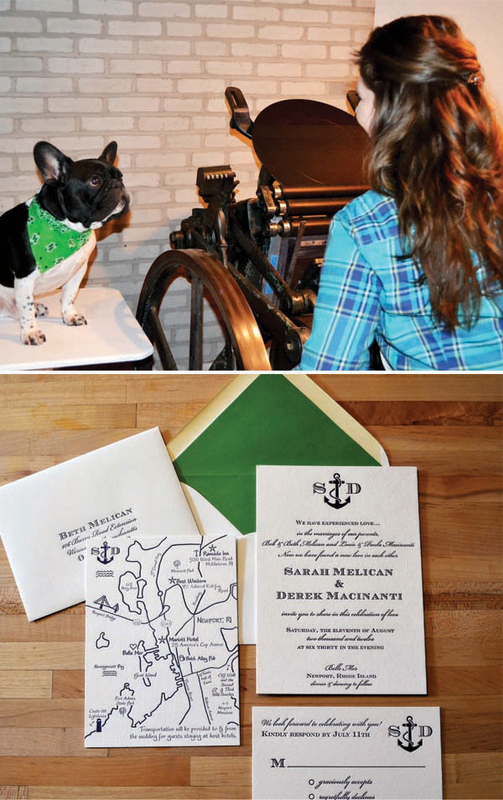 The pair printed custom letterpress invitations for their upcoming Big Day, and the experience has brought them closer by means of laughs, inks, and whole lot of printing fun! The couple caught up with us first with a nifty visit last month to get the full tour of Boxcar Press (as well as to get a few pointers on their project). Armed with good advice, Douglas and Erin purchased their custom made plates and the rest is history. Check out their printing adventure from start to finish here and get a sneak peak at the finished invitation! 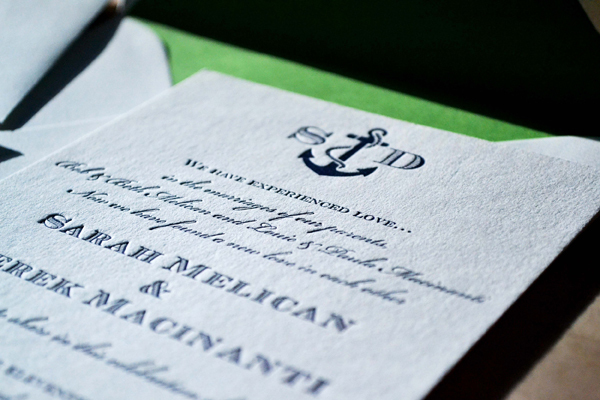 What a treat it was to work on this one-off letterpress wedding vow keepsake. 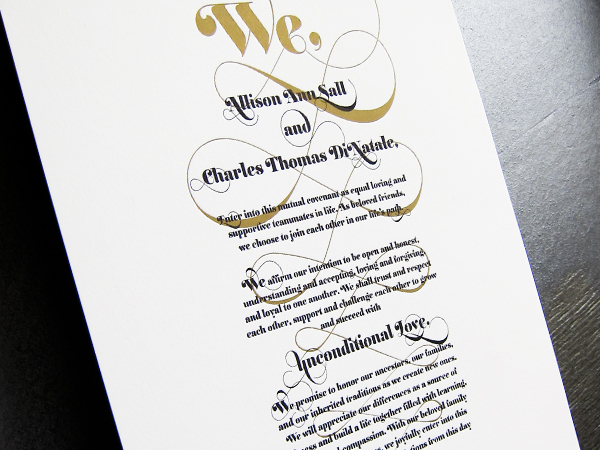 Letterpress printed on thick cotton paper in Black and Metallic Gold inks, its a very creative way to remember the true meaning of that special day. This was designed by the bride, Allison Sall proving that we have the most artistic and creative clients. by Kein Trease, Client Coordinator. This letterpress business card was just a pleasure to print and photograph (we took about 30 pictures total – we couldn’t help ourselves!). The design was perfect for (3 color!) 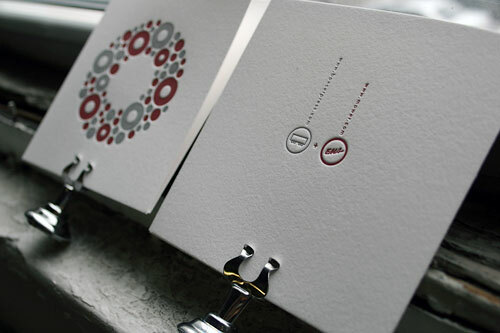 letterpress….we love the colors and the little accent of red. The back was flat printed in two colors. Vibrant and just a pleasure to hold. 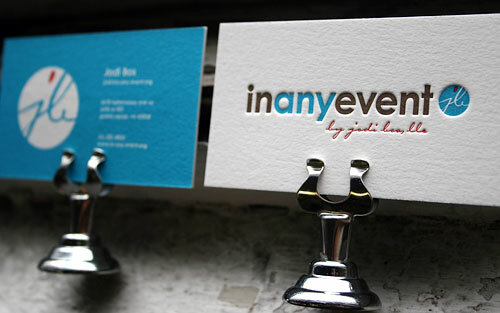 Printed for Jodi Boss of In Any Event. We love it when we get to letterpress cool things for Syracuse folks, so we were so excited to letterpress up these cards for the Everson Museum, our local art museum. They’re designed by the fabulous folks at Eric Mower & Associates, whose designers are just bright baubles of joy to work with. The cards are available for purchase via the Everson. 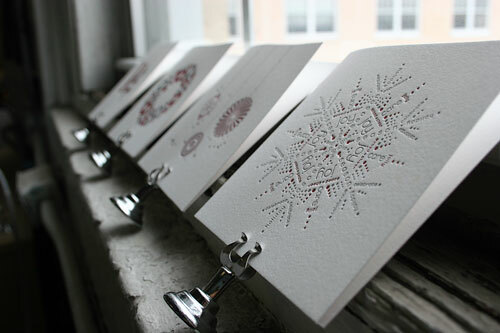 Since, over the weekend, Boxcar Press & Syracuse finally got its first substantial snow fall (hooray! 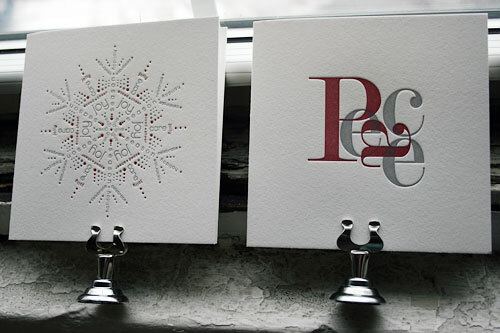 ), it seemed the perfect time to post pictures of these letterpress holiday cards that make us feel all warm and cozy.